Damascus was a thoroughbred race horse sired by Sword Dancer (1959's Horse of the Year) out of Kerala (by My Babu) foaled at the Jonabell Farm in Lexington, Kentucky. Though he finished third in the 1967 Kentucky Derby (a high-strung horse, the humidity depleted him and the noise of the crowd spooked him; he was given a stable pony thereafter to calm him down), he won so many of the other big races—the Preakness Stakes, the Belmont Stakes*, the Jockey Club Gold Cup*, the Wood Memorial, the Travers Stakes, the Dwyer Stakes (closing from 12 lengths back and spotting the runner up 16 pounds), the Woodward Stakes*—that he was 1967's Horse of the Year. And he did this in a year when not only the great Dr. Fager was racing, but so was Buckpasser. Considering that in Blood-Horse magazine's top 100 U.S. thoroughbred champions of the 20th Century, Buckpasser ranks 14th and Dr. Fager ranks 6th, this was no small feat. In a race many consider the "Race of the Century," Damascus won the 1967 Woodward by 10 lengths over both of these horses after his connections, as well as those of Buckpasser used stablemates to set a blistering pace, thus weakening Dr. Fager. Damascus himself ranks number 16 in the Blood Horse listing. In 1967, he was Horse of the Year and champion three-year-old colt, and shared the champion handicap male honors with Buckpasser. Damascus was owned and bred by Mrs. Edith W. Bancroft, whose father, William Woodward, Sr. owned Belair Stud and won five Belmonts in the 1930s. 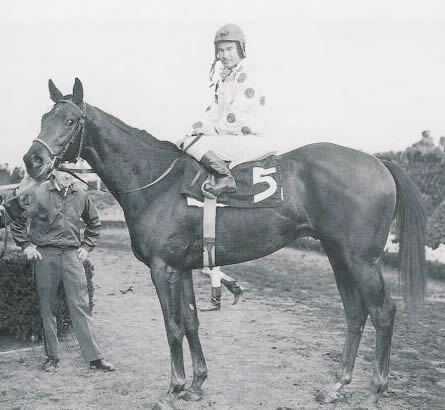 Edith Bancroft inherited the famed Belair white silks with red polka dots and scarlet cap but never used Belair as a stable name. Ironically, the greatest race of the horse's life was named for his owner's father. He was trained by Hall of Famer Frank Whiteley, Jr. and ridden by Hall of Fame jockey Willie Shoemaker. Because of the brilliance of the Woodward, with three of the most talented horses of the Twentieth century competing, race lovers often forget Damascus' performance in the Travers. Although racing fans were eager to see the two best three-year-olds of 1967 clash again (Dr. Fager had won a narrow victory in the Gotham Stakes in April), Dr. Fager's trainer, Hall of Famer John A. Nerud, opted to skip the Travers and race instead in the New Hampshire Sweepstakes. More than a few believed Nerud was avoiding Damascus. Shoemaker had publicly vowed to Whiteley that Dr. Fager would never beat Damascus again while he was in the saddle. Nerud thought his colt had some maturing to do, which could wait for six weeks for the Woodward Stakes, where the 3-year-old championship and Horse of the Year would be on the line. Without Dr. Fager, the Travers looked like a walk over for Damascus, a certain but dull win since every top three-year-old stayed away. Those that did enter—Reason to Hail, Tumiga, and Gala Performance—were good horses, but not nearly in the same class as Damascus. The track was sloppy that day and Tumiga and Gala Performance set a blistering half-mile to open up a fifteen-and-a-half-length lead on Damascus. Shoemaker was not in the slightest worried about making up the distance, but even he could not have predicted the explosion to come when he asked his horse to run. Suddenly, Damascus was virtually flying. From that far back, he was 22 lengths in front by the finish line. Damascus also won the Remsen Stakes, the American Derby (another explosive performance, setting a new track record), the Aqueduct Handicap (against older horses and carrying top weight), the Leonard Richards Stakes, the Bay Shore Stakes, the Brooklyn Handicap (beating Dr. Fager, who had beaten him in the Suburban Handicap two weeks earlier), the William Dupont Jr. Handicap, the San Fernando Breeders' Cup Stakes, and the Malibu Stakes. He bowed a tendon while racing in his second Jockey Club Gold Cup, coming in last, the only time in his career he was out of the top three. Whitely retired him to stud. In his three-year-old season, he set an earnings record for a single season ($817,941) that held until Secretariat came along almost a decade later. Out of 32 lifetime starts, Damascus won 21, placed in 7, and came home third in 3. His career earning amounted to $1,176,781. He was inducted into the National Museum of Racing and Hall of Fame in 1974. At stud at Arthur B. Hancock, Jr.'s Claiborne Farm near Paris, Kentucky, Damascus sired 71 stakes winners before being pensioned in 1989. He was especially successful with his daughters who produced champions. He died in his paddock at the age of 31 on August 8, 1995 and was buried at Claibourne.